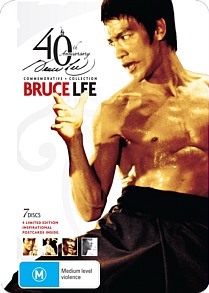 Bruce Lee 40th Anniversary Commemorative Collection 1 DVD Review Lee’s films have always showed their age, even restored as here, but this Commemorative Collection nonetheless shows them looking and sounding their best in years. In his 32 years, Bruce Lee achieved more than most people could hope to accomplish in several lifetimes. To commemorate the 40th year of Lee’s untimely passing, Beyond Home Entertainment have released a bumper 7-disc collection of some of Lee’s most well-known films, laden with bonus features and housed inside a handsome collector’s tin. Included are the special collector’s editions of The Big Boss (1971), Fist of Fury (1972), Way of the Dragon (1972), Game of Death (1978), Game of Death 2 (1981), bonus discs crammed with special features, and the set also comes with four inspirational postcards adorned with some of Bruce’s weightier philosophical sentiments. The compilers have departed from the canon somewhat in including the 1981 oddity Game of Death 2 in lieu of Enter the Dragon, particularly given that Bruce Lee’s role in the former was composed entirely of archival footage, but the rest of the set is top notch and the hours of bonus content mark it as an absolute must-see for Lee devotees. 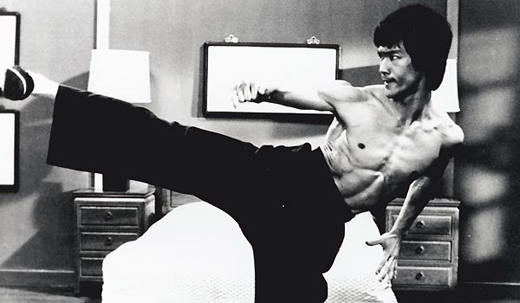 Interviews with Lee’s family members, friends, mentors and co-stars make for compelling viewing, and are thoughtfully interspersed with sparring, training and rehearsal footage (yes, including several takes of the infamous one inch punch). The films themselves are presented in an anamorphic 2.35 or 16:9, and all feature remastered two-channel English and Cantonese audio dubs. Picture quality is fairly good – Lee’s films have always showed their age, even restored as here, but this Commemorative Collection nonetheless shows them looking and sounding their best in years.